Executive Mosaic is glad to introduce Michael Flynn, White House national security adviser, as an inductee into the 2017 edition of the Wash100 — Executive Mosaic’s annual selection of influential leaders in the government contracting arena. 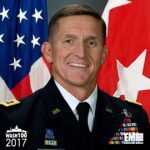 President Donald Trump appointed Flynn as national security adviser in November 2016 to conduct daily national security briefings and coordinate foreign policy and military efforts. Trump said at the time Flynn will support efforts to defeat terrorism, address geopolitical challenges and boost homeland security. “We should clearly define our enemies, face them head on and then defeat those that seek to defeat our country and our way of life,” Flynn said in a speech at the Republican National Convention. The retired U.S. Army lieutenant general previously served as director of the Defense Intelligence Agency and assistant director of national intelligence for partner engagement. Flynn served in the military for more than 30 years and held director of intelligence roles at the Joint Special Operations Command, U.S. Central Command, Joint Staff, International Security Assistance Force-Afghanistan and U.S. Forces Afghanistan. Executive Mosaic congratulates Michael Flynn and the White House team for their selection to receive this award.